Overall, the Aspire TimelineX 4820TG-5454G50Mn impressed us immensely. Its excellent battery life and build quality is coupled by very capable performance to make it a great option for those regularly on the road. Where does this leave the 4820TG? At $700 this notebook would have been a must-buy, but at $900 (which it actually costs), it flirts dangerously with the premium category, a world where lazy performance and uninteresting, lower-end build quality ensure it can't compete. The Aspire ultimately lands in an area of no-man's land where it doesn't do quite enough to justify its price. Nice little machine otherwise, though. Over the past few years, I've tried out a dozen or more ultralights, desktop replacements, and midsized machines, and while almost all have been fun to check out, none has called out, "Buy me, with your money, at this price." The 4820T is calling, or at least talking loudly enough for me to give it five stars across the board in the HardwareCentral ratings box. The Acer Aspire TimelineX 4820TG laptop sells for a price of £800 inc VAT with one year international warranty. It is not only thin compared to other 14-inch laptops - like the Dell Studio 14, Dell Inspiron 14R and MSI CX420 - but packs in quite a punch with its high performance and bundles a graphics processor that allows for a decent gaming experience on a laptop. The Acer Aspire TimelineX 4820TG also offers pretty good battery life, but nowhere close to its claimed eight hours - for that buy the Acer Aspire TimelineX 4820T. If you desire a powerful all-purpose laptop for home, one that is good for gaming, and easy to carry around, the Acer Aspire TimelineX 4820TG is the one to buy. The Acer Aspire TimelineX 4820TG laptop sells for a price of Rs. 48,999 with one year international warranty. It is not only thin compared to other 14-inch laptops -- like the Dell Studio 14, Dell Inspiron 14R and MSI CX420 -- but packs in quite a punch with its high performance and bundles a graphics processor that allows for a decent gaming experience on a laptop. The Acer Aspire TimelineX 4820TG also offers pretty good battery life -- better than any other laptop in our Top 5 Mainstream Laptops list. But nowhere close to its claimed 8 hours -- for that buy the Acer Aspire TimelineX 4820T. If you desire a powerful all-purpose laptop for home, one that is good for gaming, and easy to carry around, the Acer Aspire TimelineX 4820TG is the one to buy. A very nice – not too heavy – notebook, very well balanced and although I am not a gamer the gaming figures seem quite good. I used it both wired and wirelessly to connect the Internet and it worked efficiently with both. Yes I did play the odd game of three taking advantage of the various range of third party games Acer supply with one hour demos available. Certainly a plus and of course should you like them then you can buy the ones you like. Even ergonomically, there's almost nothing to complain about, the keys are large enough and the tactility is good too. The large multi-gesture touchpad is matte and quite smooth. The mouse buttons could have been separate instead of a single bar, but nonetheless, it's comfortable to use. It certainly looks more like a business laptop than a multimedia machine, but the performance says more than that. The first Acer Timeline generation democratised slimness and high battery life in the little world of laptops. The Acer TimelineX will appeal to those who move around a lot and don't want to compromise on performance and screen size. Its good battery life cannot unfortunately make up for the weaknesses of its glossy, poorly contrasted screen which costs it its fifth star on our rating. The Timeline X 4820T sells for Rs. 40,000. It's priced a little above the Timeline 4810TZ that comes for Rs.34,000. But you're getting two things in the bargain; a Core i3 processor that is now able to run your programs a little faster and a nicer looking design. The battery life is also better than what you'd get from a typical 14-inch laptop. If you're looking for a slim laptop to surf the net, watch movies, but feel that you should have decent processing power on demand, then the Timeline X is your perfect match. 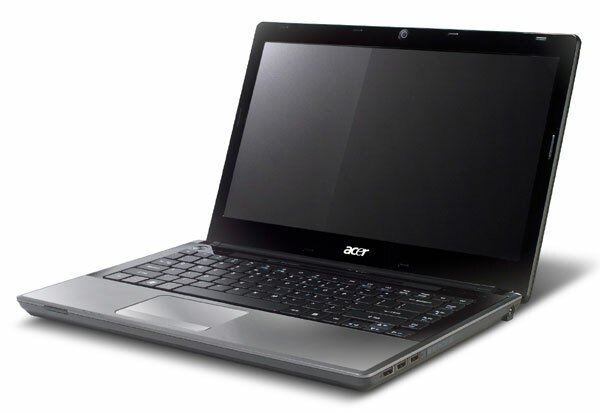 Acer has one-upped itself by providing a good mix of performance, usability and battery life with the 4820T. One year on and Acer's latest Aspire Timeline range has pulled out all the stops to produce an energy-efficient, powerful machine that doesn't quite manage to be a desktop substitute but deserves attention for considerably extending the already impressive battery life of the previous model. The Acer Aspire TimelineX 4820T is another successful addition to Acer's Timeline series of slim laptops with great battery life. The Aspire TimelineX 4820T offers the right balance between perfomance and features, not to mention a very slim and light 14-inch laptop with truly remarkable battery life. If you don't care much about graphics and are primarily interested in a slim, light 14-inch laptop that's great for outdoor use with unprecedented battery life, we highly recommend the Acer Aspire TimelineX 4820T. The Acer Aspire TimelineX 4820T is another successful addition to Acer's Timeline series of slim laptops with great battery life. The Aspire TimelineX 4820T sells for a price of Rs. 40,748 -- for that price you get the right balance between perfomance and features, not to mention a very slim and light 14-inch laptop with truly remarkable battery life. The Dell Studio 14 Artist Edition marginally edges out the Aspire TimelineX 4820T due to its inclusion of a dedicated graphics card, and therefore its wider appeal. But if you don't care much about graphics and are primarily interested in a slim, light 14-inch laptop that's great for outdoor use with unprecedented battery life, we highly recommend the Acer Aspire TimelineX 4820T. Overall, Acer has done well with its TimelineX series. It manages to keep to its successful ultra-thin and elegant design but with better components thrown in. The Acer Aspire Timeline X is here at last, promising a major upgrade from last year’s original Timeline ultra portable laptop. The 2009 model came with a mammoth nine-hour battery and more than reasonable hardware, but the new Acer Aspire Timeline X series keeps that remarkable stamina while cranking up the specs even further. Raw processing and battery power makes this great if you work on the go. Despite delivering performance and battery life to satisfy any demands, the 4820TG is a difficult laptop to recommend outright. Its design lacks refinement and the build quality could be better, while its implementation of graphics switching leaves a lot to be desired. It's a great laptop for a power-user who understands its ins and outs, but regular users may find it frustrating. Timeline X makes significant advances over the original Timeline models with thanks to the Core i3/i5/i7 CPU options and ATi Radeon HD 5650 graphics. Internals aside, the build quality and design of the chassis strike me as very average. More significantly, the battery life of the 4820TG, which is actually rather good, falls far short of the ‘up to 12 hours’ claim that Acer has been broadcasting for this range. Acer released the Timeline series last year to critical acclaim, but while the range boasted excellent portability, performance was slightly lacking. The new TimelineX range rectifies this and, despite a few usability issues, the Acer Aspire 4820T simply has it all. Compact, well specced and fairly lightweight (just over 2kg), the Acer Aspire 4820TG makes a tempting proposal for those who want to travel and not compromise on performance too much. An obvious downside is the construction quality, with a little too much flex evident. We'd have like to have seen a more advanced switching graphics system too, but it's nice to have the option.There are some really nice touches here, but given the price tag of £899, some might want to see a little less flex across the body. But you can't deny that Acer have put together a notebook that is both practical and powerful in this new Timeline X model, the 4820TG. 80.94%: This rating should be considered to be average. This is because the proportion of notebooks which have a higher rating is approximately equal to the proportion which have a lower rating.